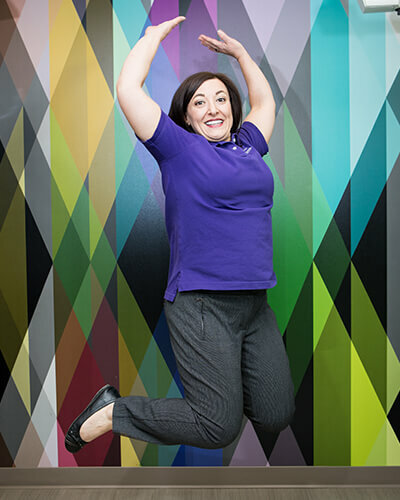 Meet the people who are as bright and vibrant as our dental practice. Our small team shares the same goal of making each visit a special experience for your family. Christy is our office manager and mom to three: Brady, Chase, and Alli. She has been married for over 20 years to her high-school sweetheart whom she met growing up in Sheridan. 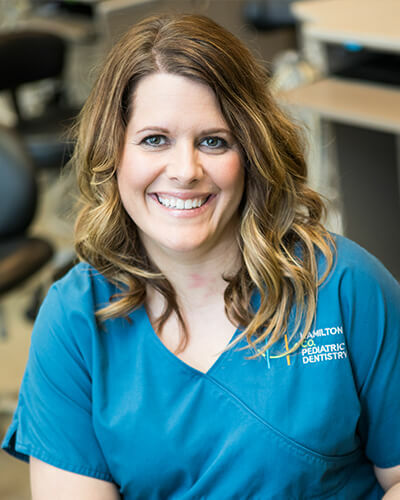 With over 20 years experience in the dental field, Christy still enjoys taking care of people, especially kids. She chose dentistry because she loves lending a helping hand and caring for others. Christy started her career as a dental assistant. She has since moved into the office manager role and is now actively involved with AADOM. 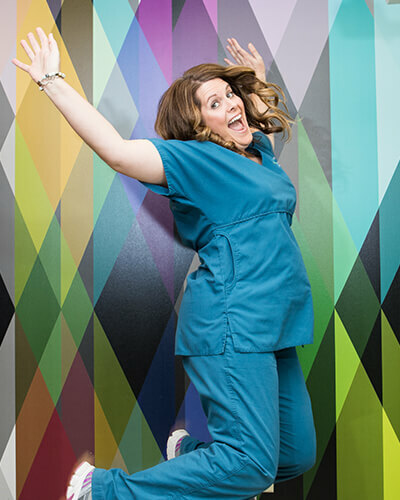 Christy has been in pediatrics for years, and she can’t imagine not working with kids every day. She loves the interaction and seeing them grow into young adults. What do you do outside of the office? Spending time with my family at the barn and at livestock shows. Our family raises Southdown sheep for the 4-H fair. I love to scrapbook when my schedule allows. I became involved with Crossfit over a year ago and you can find me at the gym 4 days a week. Who is your hero? Why? My mom is my hero. She came into my life when I was young and has always been there for me. I know no matter what the situation, she will be there to support me and lift me up when needed. She stepped into a role that she didn’t have to and has always taken that role seriously. What “lesson from mom” do you still live by? Unconditional love and support for others. What flavor ice cream would you be? Vanilla. It is dependable, consistent, tried and true. Mariah was born and raised in Indianapolis, Indiana with her two brothers and sister. She was married in October of 2017 and now lives with her husband, Jordan. 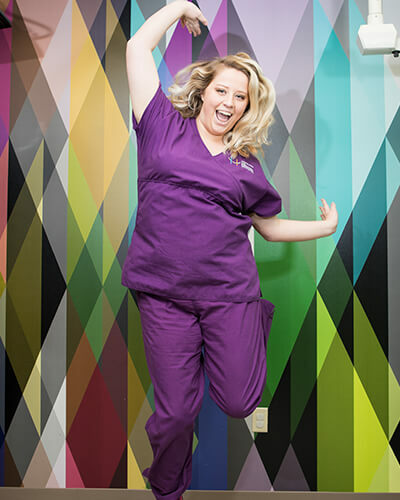 Mariah went to the Indianapolis Dental Assistant School and previously worked as a dental assistant. She has experience in general dentistry, pediatrics, endodontics, and orthodontics. Mariah is very involved with her church, Calvary Tabernacle, and volunteers with the children’s ministry team. She is also an accomplished singer and participates with music worship. Mariah has loved to sing since she was a little girl! What do you do outside of the office? I love to spend time outdoors. Some of my favorite hobbies include hiking, fishing, and hunting with my husband and his family. Who is your hero? Why? My parents have always been my heroes. They are both selfless and have always sacrificed for our family. They are my biggest supporters and my constants. I know I can always count on them. What “lessons from mom” do you still live by? Never let anyone dull your shine. What flavor of ice-cream would you be? Strawberry – Simple and sweet. Jamie is mommy to two boys, Eli and Knox. She views Jackson, MI, and Covington, IN as her hometowns as both are close to her heart. Her boys are active in taekwondo and they all currently reside in Noblesville, IN. During high school, Jamie loved anatomy class and this led her into the medical field. Jamie got her Bachelors in Health Art at the University of St. Francis and then her Associates in both Arts and Dental Hygiene. Jamie spent five years as a dental assistant before becoming a hygienist. She has now been cleaning teeth for over 15 years, with the last 10 years devoted specifically to pediatrics. She truly loves helping your kids enjoy their dental experience and have fun at our office. Having a family of her own means she loves to make personal connections with kids and other moms and dads. What do you do outside of the office? Being active with my boys, exploring parks and activities in our area. Spending time with friends having a coffee or sushi. Learning and teaching about wellness with essential oils. Who is your hero? Why? All moms who are real, imperfect, and doing their very best every day. What “lesson from mom” do you still live by? The importance of sitting down and having dinner together as a family. What flavor ice cream would you be? Coffee chip. My two loves coffee and chocolate chips together! Cierra was born and raised in Noblesville, IN and is mommy to a daughter named Aralee. She loves spending time with her daughter by snuggling on the couch and watching movies or exploring outside. 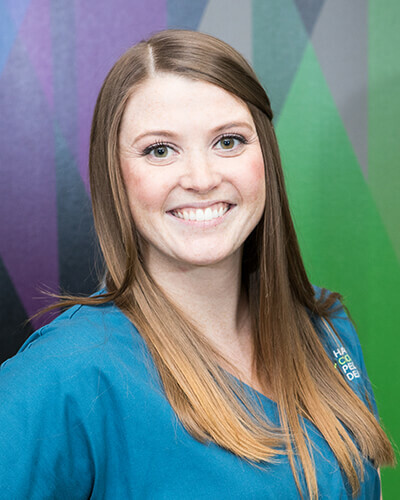 Cierra is a certified dental assistant, with additional coronal polishing and fluoride application training. She has always loved going to the dentist (even when she was a little girl) and thrives when learning new information. She especially enjoys learning about patients and new advancements in dentistry. However, nothing can beat the enjoyment of working with children and seeing them feel comfortable and have fun at the dentist office. What do you do outside of the office? I enjoy spending time with my daughter and hanging out with my friends. I especially like the outdoors and regularly go exploring with Aralee. Who is your hero? Why? My parents! They have taught me many things in life and are always there when I need them for help or advice. What “lesson from mom” do you still live by? Never try and fit in, always be yourself. What flavor ice cream would you be? Cookie dough – everyone LOVES cookie dough. Shelby grew up in Fishers, IN with her parents, two brothers, and their two family pets. She now lives in Indy with her boyfriend, Trent, and their pets, Guy the Cat and Mac the Dog. 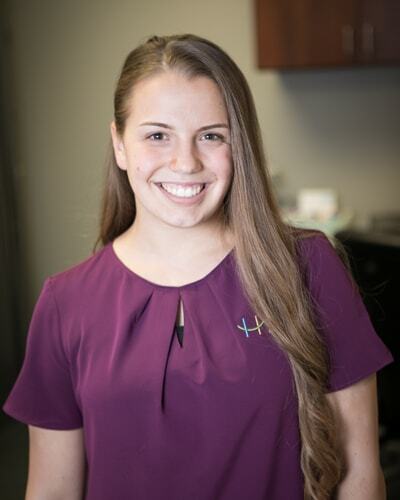 Her path to dentistry began because she has a passion for helping people and enjoyed volunteering in the community. Shelby realized kids dentistry would allow her the opportunity to continue helping others and educate them on the importance of oral health. So, she attained her Bachelor of Science and trained in Dental Assisting at the Indiana University School of Dentistry. She started working in our office as an expanded dental assistant. 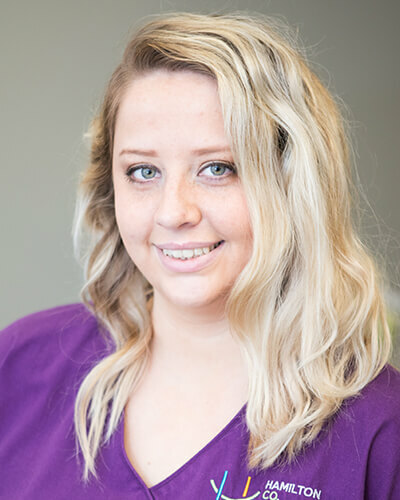 Shelby continued her training and assumed the additional roles of clinic coordinator, lead orthodontic assistant, and operating room assistant. 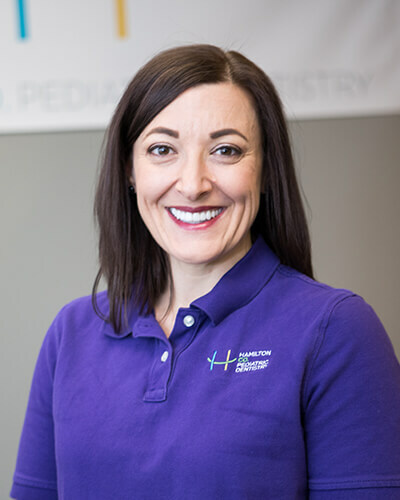 Since working at Hamilton County Pediatric Dentistry, Shelby has loved being able to turn a fearful experience into a positive one for both kids and their parents. What do you do outside of the office? I love going to sporting events (Colts, Pacers, and IU.) I also enjoy spending time with my nieces, Kylie and Emma, or playing with Guy the cat and Mac the dog. Who is your hero? Why? My mom, Mindi. I love that she is a strong and passionate woman. I only hope to be half the woman she is. What “lesson from mom” do you still live by? My mom has always made sure that family is first. This has stuck with me throughout the years. I appreciate how close my siblings and I are now, even as adults. What flavor ice cream would you be? Rocky Road because I’m always up for an adventure! Teaming up with those in Hamilton County. It is our ambition for all kids, big and small, to achieve a beautiful, healthy smile. Each year, Dr. Juntgen volunteers her team and resources to provide FREE oral health care to young children who don’t have access to dentistry. This event is supported by the American Dental Association and has helped over 5.5 million kids achieve a new smile. I'm still talking about how wonderful these ladies are! It was our first visit and I definitely can't wait to go back with Lucy! Great job ladies! Designed for children, enjoyed by all! Hamilton County Pediatric Dentistry has the equipment and facilities to care for children of all ages. We have monthly contests, reward, and games for kids to play. We are also very active on social media. The open plan of the office helps generate interaction in both young and older patients, which creates a family-feel and friendly buzz. Dr. Juntgen and our team hope you enjoy your unique visit to our practice. Everything in our office revolves around kids. We offer before and after school appointments, lots of parking, modern technology, and specialty services in an accessible location. We do all we can to make your child’s visit easy. We also try to lessen the stress on busy moms and dads by offering family appointments where all siblings can be treated at the same time. 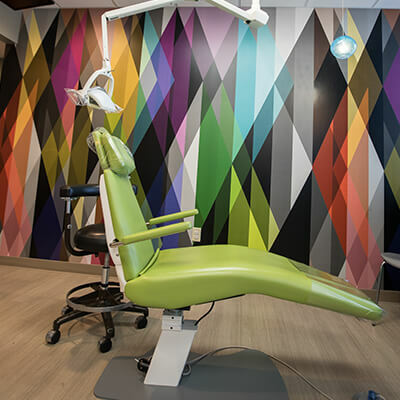 Ready for a dental visit custom-designed for your child’s needs? We take the extra step of setting up an initial call where we get to know a little about you and your family. This information allows us to create a unique experience for each child. From welcome signs to movies and games, we are prepared to distract and entertain kids in a comfortable environment. When your child visits our practice, he or she gets an instant and exclusive pass to the Kid’s Corner. This area of our lobby is packed with books and games, as well as a movie screen. 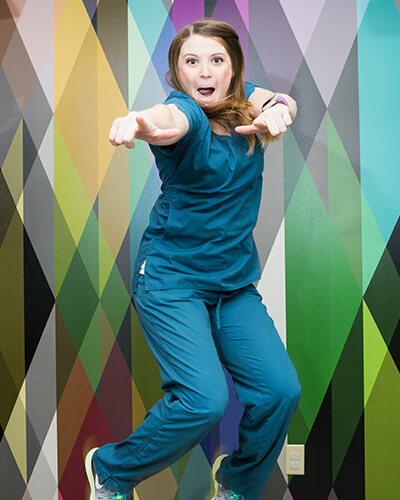 Our team loves to be silly, so we may play special games or start a Nerf war while your child is visiting! 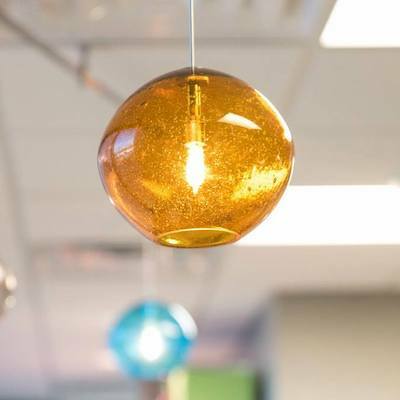 We also paint nails, apply temporary tattoos, and run in-office contests. We do whatever it takes to make kiddos feel at ease and happy during their stay. We are all moms, so we know what matters most to your family. Children need a flexible approach and caring team.